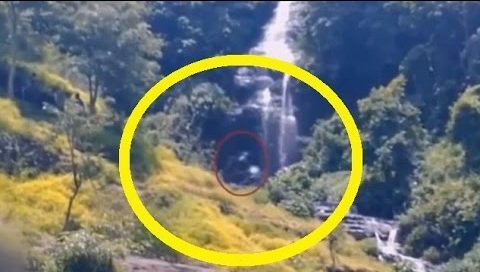 A new video claiming to capture a Bigfoot bathing underneath a waterfall in Indonesia has been attracting widespread attention on-line recently. Could this be the proof that Bigfoot is real? Probably not. Big surprise, we know. While Bigfoot or Sasquatch is primarily known as a North American oddity, believers do not rule out the possibility that man-sized apes walking on their hind legs could have migrated to Indonesia. RELATED: Was Bigfoot Sighted on a Live Webcam? The island nation does not have any bears, but it does have gorillas. Could the image be a gorilla or perhaps a person swinging a pale of water? In the video the being appears to come into view beneath the waterfall carrying something shiny, causing some to speculate that whatever it is could be bathing. Maybe it’s a simple explanation, but the scale of the creature suggests it could be eight feet tall. As usual, the image is grainy and inconclusive. Watch for yourself below from Bigfoot TV.